The guttural grunt of a howler monkey shattered the tranquillity of the night, the primeval sound booming loudly through the jungle canopy. 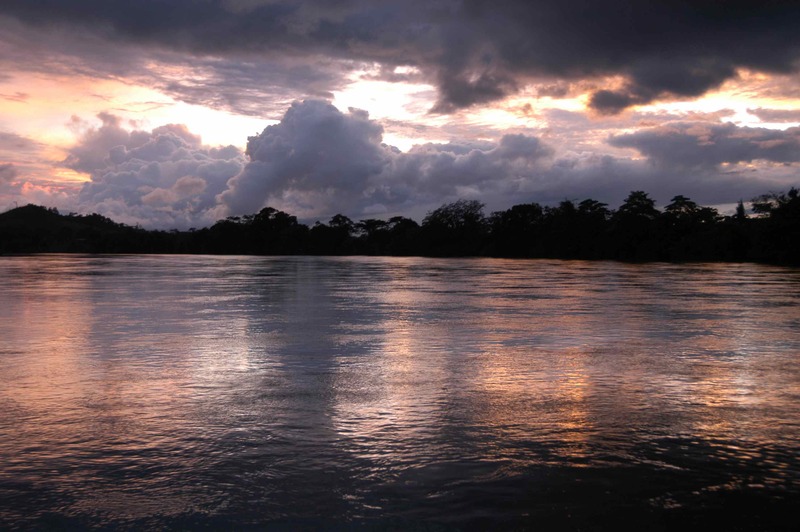 Lying on my bed in the inky black darkness or ore-dawn in the tropics, encases within a mosquito net, I could here the first birds starting their morning chorus, their calls mingling with the soothing sounds of the great river that was flowing just a few feet from where I lay. Then I heard a swirl, a loud splash and a gulp, the distinctive sound of a tarpon engulfing some hapless baitfish being swept along in the rivers timeless flow. Dawn in the Nicaraguan rain forest; time to get up and go fishing! The Rio San Juan is something of an enigma. Commencing its life on the southern shores of Lake Nicaragua at San Carlos, it flows sedately following a generally easterly direction towards the Caribbean Sea, which lies some 120 miles away. Flowing through some of the most pristine rain forrest in Central America, these rich, tannin stained waters are home to an amazing population of fish, which include the multi-hued rainbow bass, guapote, mojara, mochaca, the fearsome alligator gars and countless other freshwater species. 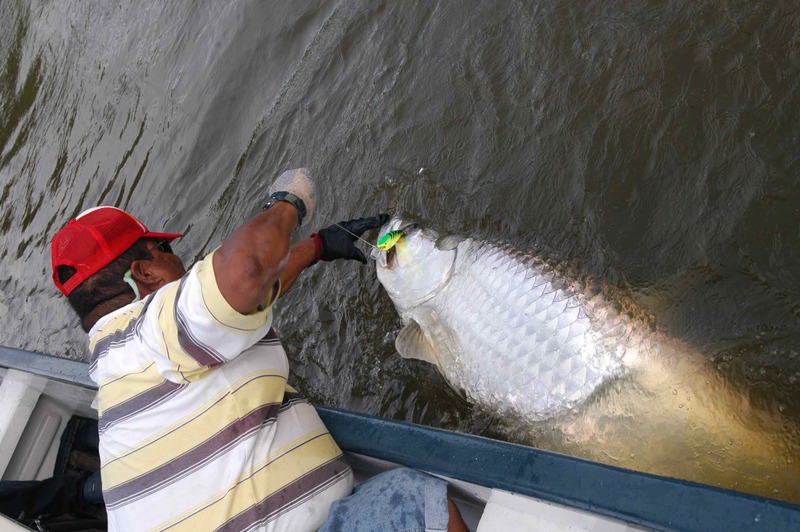 The river also pays host to huge numbers of tarpon and snook; two of the most esteemed species of saltwater game fish-and then there are the sharks. Lake Nicaragua is the only place in the world where sharks, in this case fearsome, man-eating bull sharks, are known to breed in freshwater. While in recent decades their numbers have been decimated by commercial fishing, now thankfully banned, our guides had already confirmed there were still plenty of bull sharks along with prehistoric looking giant saw fish swimming in the river. My adventure had started the previous week, when our group flew into Managua, the Nicaraguan capitol. 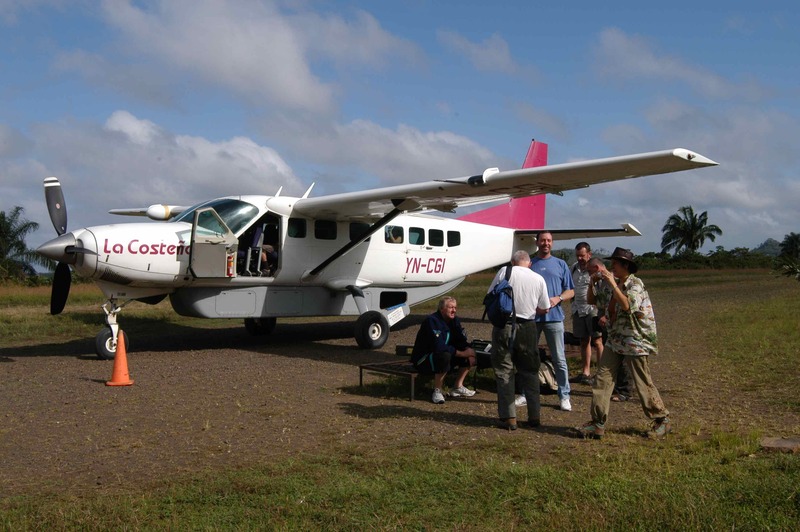 After an overnight stay at a hotel next to the airport, we had boarded a 12 seater Cessna and flew across the great expanse of Lake Nicaragua to a gravel airstrip cut into the thick bush on a low hill above San Carlos, a ramshackle town of tin shacks, barking dogs and Salsa. Here we boarded a small boat for the brief trip across the river mouth to our base for the first week; San Carlos Sport Fishing Lodge. My boat companion for this trip was Chris Tarrant, and following a light lunch, fried chicken, rice and beans that foolishly I’d heavily laced with the local hot sauce, we had loaded our rods onto a skiff and were speeding down river to one of the most productive tarpon hot spots, just below the cable ferry crossing near Isla El Pitazo. 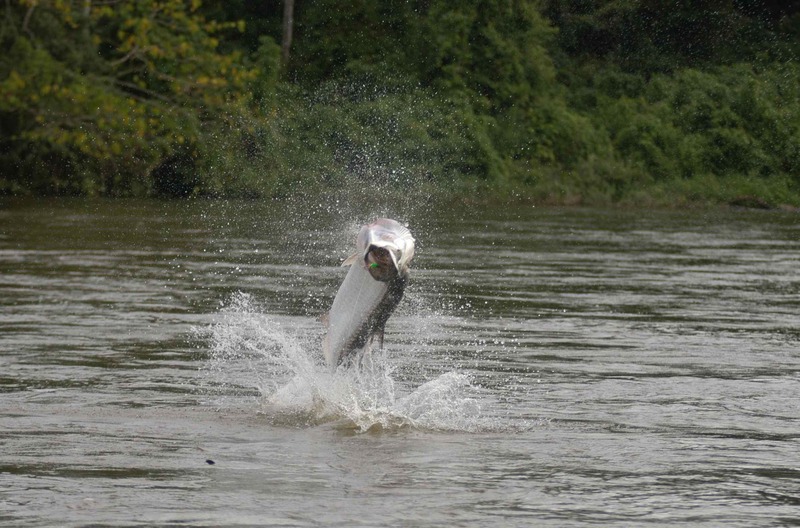 Our guide and boat captain, Eliecer Jarquin Mena, explained we would be trolling lures, typically heavy bodied Rapala Super Shad Raps, across a succession of deep holes cut into the bed of the river, in which he informed us the tarpon tended to congregate. With three lines out we commenced trolling, sedately chugging our way back up river while marvelling at the incredibly rich bankside flora and fauna. Trolling can hardly be described as one of anglings more interesting of angling techniques, in fact at times it can be positively dull, but there can be no denying its effectiveness when it is necessary to cover vast expanses of water in order to present a lure in front of a hungry fish. On that first afternoon we had barely trolled for fifteen minutes before we had our first strike of the trip. 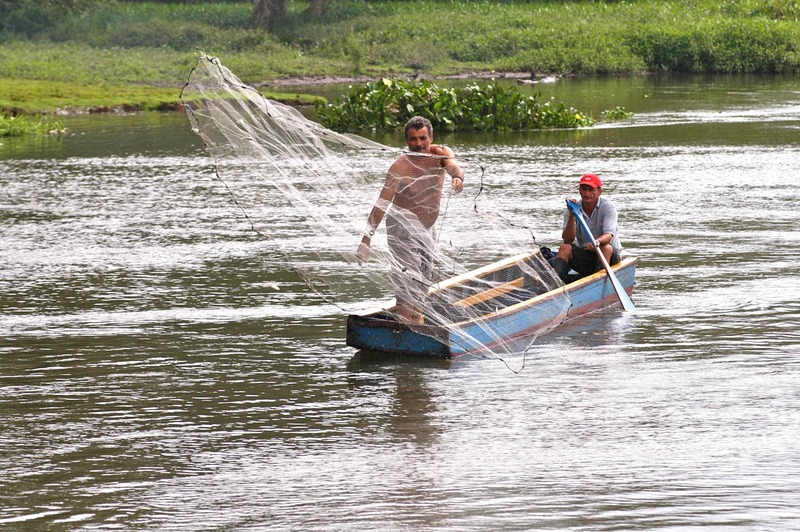 We were trolling within 30ft of the adjacent riverbank, Eliecer occasionally shifting the tiller arm to dodge a floating raft of water hyacinth. When I noticed the tip of one of the rods dip sharply I thought it had snagged a strand of weed, but a split second later it was all but wrenched from its holder in the starboard gunwale as six foot of shivering, gill rattling silver exploded into the air, the brightly coloured lure clearly visible in the corner of its mouth. Chris grabbed the rod, and we had watched in awe as yard upon yard of line was ripped off the spool prior to the huge fish, which we could all see was considerably in excess of 100lb, erupting out of the river for yet another spectacular series of jumps. Then the line went slack. Nobody said a word. Chris retrieved the lure, the crew readied the boat to re-commence trolling, I fiddled with my cameras. Chris was the first person to speak, swinging the lure to hand he remarked, “Look at these hooks, no wonder the fish came off!” On inspection I could instantly see what he meant. 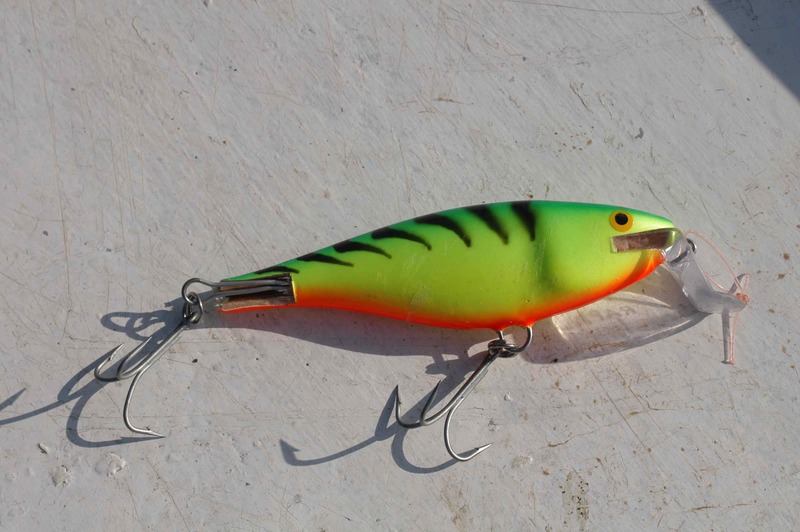 We had been using brand new lures, yet the points of both hooks had been all but straightened. A one off perhaps; but unfortunately not. Next it was my strike and within half an hour of resuming fishing I got my chance to experience the awesome power of a fish an excited Eliecer announced would possibly have made 200lb, but within minutes of the strike I, too, was cursing the totally inadequate hardware that had been fitted to my lure. Chris took the third and final strike of the day, and when after ten minutes of explosive acrobatics and line ripping runs as the fish cartwheeled down river he was still firmly attached to the fish, we actually thought we would stand a chance of landing it. An hour later we had drifted and been pulled perhaps a mile down river, and still Chris was fighting his fish that as yet was showing no sign of tiring. Sat on a cool box on the bow he applied as much pressure as he dared, the fish occasionally breaking surface as it gulped air. After an hour and a half we were drifting past a ramshackle village with a totally unpronounceable Spanish name that when translated meant ‘Half Cheese’, and by this stage it was hard to tell who was tiring the quickest, the fish or Chris. Then finally the leader surfaced alongside the boat and Eliecer leant out, grabbed it, and ever so carefully pulled the great fish the remaining few feet to the boat, where yet again it exploded angrily on the surface, snapping the 100lb BS mono leader in the process…I think Chris was relieved as much as elated at catching his first Nicaraguan tarpon! The next few days were tough. We had upgraded the hooks fitted to our lures to ones more suitable for the job, but a succession of unseasonable, heavy tropical down pours had coloured the water to the consistency of hot chocolate and caused the river to rise slightly. The fish were still there, continually teasing us by rolling or jumping clear of the water, but apart from an occasional half hearted swipe at a lure they had developed a serious case of lockjaw. The only event of note was yet another extended battle with Chris on the rod from an especially strong fish that was foul hooked in the dorsal fin, and which gave Chris a thorough battering before eventually the line broke. After three days at San Carlos we moved to a second waterside lodge at Sabalos, forty miles down river. Here we changed boats and crew and once again went trolling. It was my strike and when it came quickly that first morning it was clearly another monstrous tarpon. Again and again the great fish jumped, running first down, then across, then back upriver. I kept the rod tip low in an attempt at preventing the fish from jumping and, more importantly gulping air, a typical tarpon trait with each successful gulp of air adding at least another five minutes to the fight, as Christian, our new skipper, skilfully manoeuvred the boat around the river. The tactic worked and about half an hour later I was struggling to hold an estimated 100lb tarpon for the cameras prior to release. We had spotted the sloth as I played my fish, and at first we had thought it was dead, but the second time we saw it drifting along in the current we could see that despite being covered in a layer green mould its stubby little limbs were moving, the thing was alive! Clearly a photo opportunity not to be missed, I goaded and teased Chris to grab the sloth and pose for a picture or two; of course I couldn’t hold it…I had to take the photo’s! At first Chris was having none of it and it was left to Fernando, our ever helpful crewman, to lift the helpless animal into the boat. Eying its fearsome looking claws Chris was even more determined not to handle the thing, but eventually we managed to goad and persuade him to pick it up, albeit at arms length. 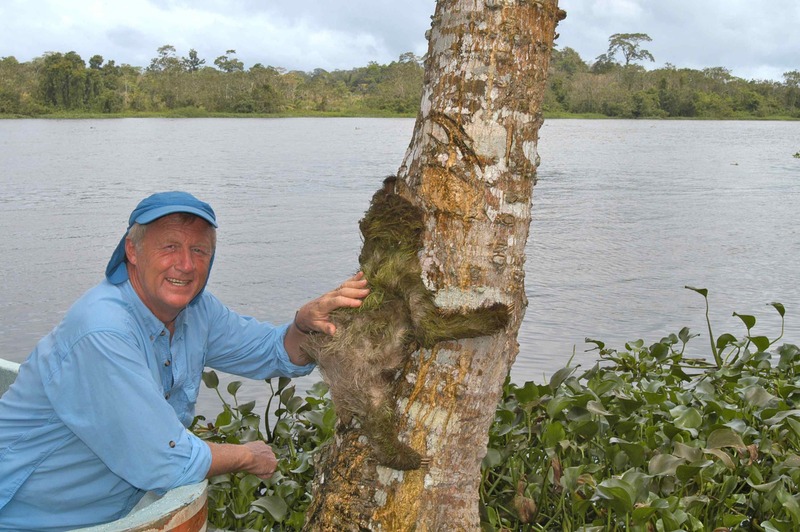 As Christian gently took us ashore I think Chris actually became quite attached to his mouldy little friend, and at the rivers edge he gently placed the sloth onto the trunk of a tree, at which point it leapt into the high canopy like a startled leopard. Well, that’s not strictly true, actually it clawed its way up into the foliage at about the same speed that grass grows, but our animal rescue complete, it was time to resume fishing. Chris Tarrant & his new furry friend! Just below our base at Sabalos, the gentle flow of the Rio San Juan is interrupted by an impressive series of rapids. The positions of many sizeable boulders are clearly visible, marked by the long glides of smooth water immediately behind them. 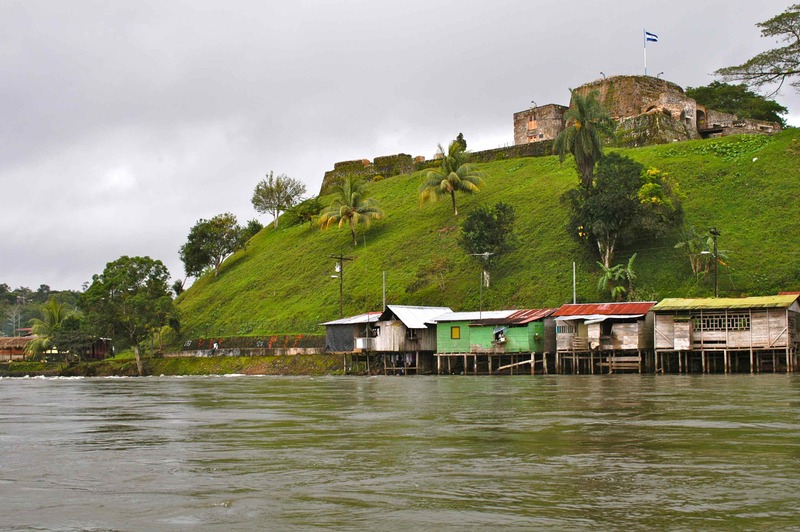 The river here, and at a second even more impressive set of rapids further down steam adjacent to the ancient fortress town of El Castillo, is full of tarpon. Sit back and watch the river at either of these locations, and you’ll not count 30 seconds without seeing at least one hundred pound plus tarpon jump or break surface, during our trip we estimated seeing fish well in excess of 200lb on average every 20 minutes. Both places, though, are thoroughly infuriating places to fish as mostly these fish snub every size, shape or colour lure you present to them. Chris’s best tarpon came on the last afternoons fishing of the trip. We were trolling an area that Chris, a passionate salmon angler, had named ‘The Chapel Pool’, after a lone, stone built shrine on the south bank of the river, and the fish had struck in the same place where previously I had caught my best fish. The sun was low and glowing a deep orange in the western sky, beautifully illuminating the lush vegetation on the far bank of the river, when in an impressive boil of water the fish inhaled the lure and started jumping. Is there a better species of sport fish than the tarpon, I don’t think so. That fish jumped and jumped like no other tarpon we had hooked so far that trip, clearing the surface of the river at least 20 times on its initial run. I could see by the determined look on Chris’s face that while clearly he desperately wanted that fish, he was fully expecting it to throw the hooks at any time, though thankfully it was on a lure with upgraded hardware that held firm. During a truly monumental 40 minute battle the fish continued to jump and run, then jump and run some more in the dramatic style that identifies the tarpon as being the undisputed king of the inshore species of gamefish. 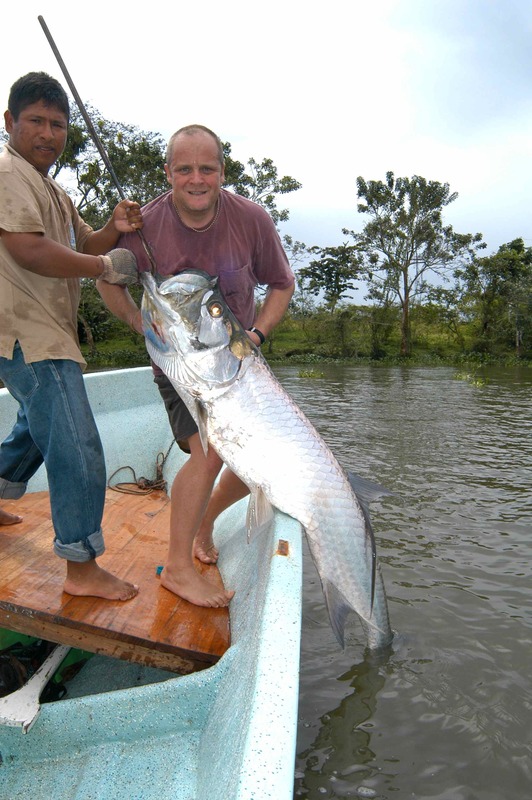 By now Chris new exactly what to expect from these mighty Nicaraguan river leviathans, and eventually careful, controlled, steady pressure took its toll, and we managed to grab the leader on an estimated 130lb silver flanked beauty. What a way to end a magical trip.